St. Patrick’s Day originated as an Irish holiday, but in the past century, it has transcended cultural boundaries to become celebrated by people of all nationalities from around the world. Ireland is known as the home of Guinness beer, and enjoying a couple of beers in a responsible manner is a great way to usher in the spring festivities. 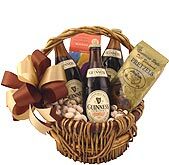 An even greater way to do so, however, is with Irish beer gifts and St. Patrick’s Day beer gift baskets. St. Patrick is the patron saint of Ireland, and he is said to have passed on March 17 in the year 493. He is popularly known for ridding the country of snakes, and in 1588, an annual feast day in honor of St. Patrick began on the anniversary of his death. In the centuries that followed, many Irish people immigrated to other countries around the world, but they continued to celebrate the feast of St. Patrick wherever they went. Today, St. Patrick’s Day is a government holiday in Ireland and Northern Ireland, but in the United States, it is an unofficial holiday that is widely celebrated. As the old saying goes, “Everyone’s Irish on St. Patrick’s Day.” Parades are held and beer is enjoyed as people from all backgrounds regale in all things Irish. On St. Patrick’s Day, we wear green and listen to Irish folk music, or we join one of the many sing-alongs. 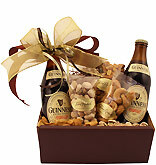 What helps those songs get started are a few delicious beverages, and what helps even more is when they are given as gifts. 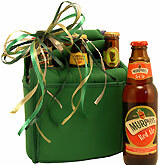 Irish beer gifts for St. Patrick’s Day are thoughtful and show that you appreciate your friends and family. 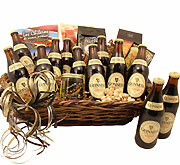 At BeerGifts.com, we have developed a large selection of Irish beer gift baskets for St. Patrick’s Day or any day of the year. 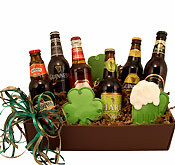 Many of these attractive beer gifts are filled with bottles of Guinness Draught and Guinness Extra Stout, but if you are a fan of Irish red ale, we also have something for you. 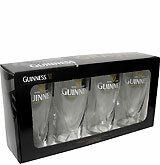 In addition to beer baskets for St. Patrick’s Day, you can also enjoy a holiday tee shirt, a set of Guinness tulip glasses and a subscription to our exclusive BeerGifts.com Beer of the Month Club. When a small brewery by the name of Lady's Well Brewery opened in Ireland in 1856, no one could imagine that it would one day become an acquisition of Heineken International. The first shift was to the Murphy's Brewery name, but it was eventually purchased by Heineken and transformed into a brand appreciated around the world. Murphy's Irish Red was created by Heineken brewers with the intention of appealing to Americans and other international beer drinkers. The brew is now one of the brand's leading exports, and it may turn into your favorite deep red beer. It's best enjoyed by pouring it into a glass to savor the intense amber color with beautiful orange highlights. 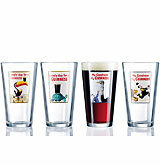 The head rises up proudly and then dies back, leaving some lacing along the sides of your glass. The flavor is intensely sweet with a blend of caramel and toffee, but it pairs beautifully with cabbage and other Irish foods. You'll understand why the Smithwick's brand is widely appreciated in Ireland once the aroma produced by their Irish Ale hits your nose. The company was formed in 1710 and remains an Irish favorite because they continue to produce clean, refreshing beers that give drinkers an opportunity to taste something good while stepping away from the stress of daily life. The Irish Ale experience starts out with a brisk fruity aroma with floral hop accents and the biscuity appeal of caramel malts. It pours a deep ruby red that is clear and topped by a creamy head. The flavor is slightly toasty from the inclusion of roasted barley, but the expert brewers have created a perfect balance between the sweet ale malts and the bitter hops. If there was one beer that could appeal to dark brew lovers as well as those who prefer to keep it on the lighter side, this Irish Ale would fit. It goes down smooth without overpowering your favorite meal, so set it on the dinner table or pour a glass for lunch. Few beers have a history with as many twists and turns as Harp Lager. This Euro pale lager was first introduced by Guinness in 1960, but it has changed brewers and distributors multiple times over the years. Due to a following of fans and adequate interest from brewers around the world, the beer continues to hit shelves in multiple countries today. The initial brew was crafted from pure water sourced from the Cooley Mountains in Dundalk, which was the location of the starting brewery. The ingredient list of the recipe used today is unknown, but the Dundalk brewery is no longer in operation and the beer is produced in multiple countries. 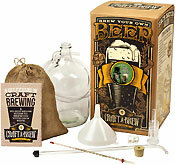 The beer delivers intense flavors of grain with moderate sweetness. While it may look like a dark beer from the brown bottle, it pours a golden yellow with a mild aroma. With a tall head of foam that holds its own sip after sip, this is the type of brew that goes down smooth while you're watching the game or relaxing on a sunny afternoon. George Killian's Irish Red is the type of beer that you keep in the fridge for long nights, special dinners and impromptu celebrations. While the flavor isn't too intense, it does deliver a satisfying malty sweetness backed by bready notes of enthusiasm. With a full body and just the right touch of carbonation, you can count on Irish Red to blend well with any food that you put on the table. It also goes well with a variety of sweet and salty snacks, so bring it out when you're ready to celebrate or when you just need a little comfort. With a delicate blend of sweet malts and citrus-inspired hops, this beer goes down smooth enough to justify everyday drinking. It also offers a generous off-white head that bubbles to the top of your glass, encouraging you to pour another and another. While this ruby red brew was originally created by one brewer interested only in having a good time with friends, it's now one of the most popular beers produced and distributed by Coors.